A LEADING North-east organics recycling has reached a significant milestone in the production of its agricultural compost. Keenan Recycling, based at New Deer in Aberdeenshire, which currently produces around 30,000 tonnes of BSI PAS100 agricultural compost per annum, has delivered over 250,000 tonnes of agricultural compost to farmers in the area since production began in 2004. The firm reached the significant figure when local farmer, Davie Smith of Inkhorn Farm, Auchnagatt, placed an order for 6,000 tonnes of compost earlier this year. Keenan Recycling processes around 50,000 tonnes of organic waste every year saving customers nearly £4million in landfill tax, which results in a net saving of around £2.5million per annum when composting costs are taken into account. The composting operation also provides environmental benefits as organic material tipped in landfill sites gives rise to large quantities of methane, one of the worst greenhouse gases, unlike the composting process which does not produce the gas. 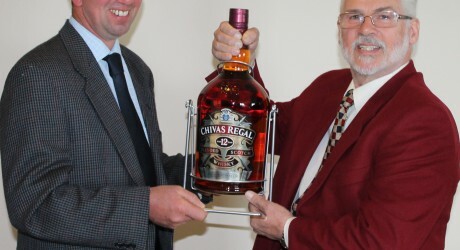 Keenan Recycling decided to mark the occasion by presenting Mr Smith, who is a regular customer, with a very special bottle of whisky, a gallon of Chivas Regal from Strathisla Distillery. Mr Smith said: “I use Keenan Recycling’s premium grade compost and have seen a marked improvement in the fertility of my land together with improved yields and a reduction in bagged fertiliser costs. Organic recycling firm, Keenan Recycling, recently increased its business into Inverness and the surrounding areas and currently processes in excess of 50,000 tonnes of waste per year at the award-winning £5million facility, collecting food waste from more than 500 businesses across the region. To find out more about Keenan Recycling and their Commercial Food Waste Collection contact Keenan Recycling on 01771 644883.